On this episode of DTB’s “Dream Tour”, the bluegrass band, Yonder Mountain String Band, discusses their ultimate tour lineup. On this episode of DTB’s “Tour Pranks”, the bluegrass band, Yonder Mountain String Band, reveals the pranks they’ve pulled on tour. Yonder Mountain String Band is currently supporting their latest album, Love. Ain’t Love. On this episode of DTB’s “First Concert Ever”, the bluegrass band, Yonder Mountain String Band, chats about the first concerts they ever went to. Yonder Mountain String Band is currently supporting their latest album, Love. Ain’t Love. On this episode of DTB’s “Preshow Rituals”, the bluegrass band, Yonder Mountain String Band, talks about what they do before taking the stage. Yonder Mountain String Band is currently supporting their latest album, Love. Ain’t Love. On this episode of DTB’s “Bus Invaders”, we take you inside the touring vehicle of the bluegrass band, Yonder Mountain String Band, while on tour with The Last Revel. Yonder Mountain String Band is best known for their songs “Franklins Tower” and “Half Moon Rising”. 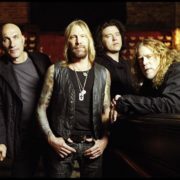 The rock band, Gov’t Mule, has announced a North American tour, for April through August. This tour is in support of the band’s upcoming album, Revolution Come… Revolution Go.